A couple of weeks ago I purchased this book through my swagbucks earnings from Amazon. I loved their first book so much that I was eager to read this one. Yes, it proves to be just as wonderful as the first. The Duggars are just so down to earth and pleasant, their book is easy to read and full of good Godly wisdom. 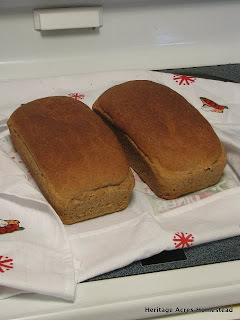 One of the recipes I tried today was their Golden Wheat Bread. I looked around their website to see if I could link up the recipe there, but I couldn't find it. It isn't exactly like this one, but it's close. Homemade bread is such a grand thing. It just warms the heart to know you are feeding your family well. Not only is it nourishing with a good meal or a bowl of soup, but put a pat of butter and some homegrown jam on it and you have dessert too.